The curious object known as the Roswell Rock was found near the Roswell crash site in New Mexico. The rock displays a curious pattern together with magnetic anomalies: when magnetic influence is placed over the thickest part of the Roswell rock, the object turns counter clockwise. However, when placed above the lower crescent and circle, the thinnest part of the rock, the object reverses and turns clockwise. An enigmatic object—found near the alleged Roswell alien crashsite—called the Roswell Rock has created confusion among those who have studied it. Said to possess mysterious properties, many believe the curious artifact—discovered in 2004—belonged to an alien race that visited Earth. On September 4, 2004, a man named Robert Ridge went out hunting. During the day, as he explored the territory near the Roswell crash site he came across a curious object protruding from the ground, with a curious pattern embedded on its surface. After picking up the artifact and cleaning it, he noticed a set of patterns and symbols on its surface that immediately caught his attention. The Roswell rock has a curious symbolism: Two crescent moons joined at the corners, a pattern eerily similar to those that tend to appear on Crop Circles. The design of the Roswell rock is fascinating. Anyone who has had a chance to see it will notice that it seems as if it had been crafted with incredible precision. According to Mr. Ridge, the Roswell rock is evidence of perfect machinery. 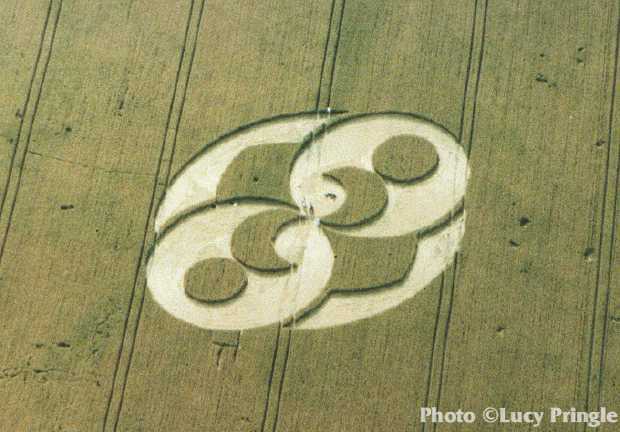 Interestingly, the design depicted ontop of the Roswell Rocked perfectly matches with Crop Circles that appeared in Liddington, England on August 2, 1996. This, together with the fact that the mystery artifact was discovered in extreme proximity of the alleged Roswell Crash site. The Roswell Rock could be two things. Either it is in fact an alien artifact that was ‘left behind’ by Alien visitors, even possibly those ‘little green guys’ who managed to travel across the universe and then crash near a farm in Roswell, or it is a very intricate forgery. In order to find out what the object really is, Ridge contacted two ufologists, Chuck Zukowski and Debbie Ziegelmeyer, at the 2007 Roswell UFO festival. Chuck and Debbie were trying to find out over the next year if it could be a souvenir from one of the stands at Roswell. They noticed that the color of the rock was the same as that of the carved surface, so they assumed that it was not a recent work. In addition, after studying the artifact under the microscope, researchers could not see the marks of the tool that was used to make the engraving. Curious right? What kind of tool was used to make the engravings but did not leave any marks behind? Comparing the Roswell rock to the crop circle found in Liddington, England you’ll notice that even though they may seem identical, they are not. Many believe that the engraving on the Roswell Rock depicts the existence of parallel universes, offering clues about portals and wormholes that we are yet to find. That, of course, varies from person to person. For me, it just looks like a really cool rock with weird magnetic properties. Anyway, researchers found that the Roswell rock has a strong magnetic attraction, narrowed down to the presence of magnetite. Furthermore, an energy dispersive fluorescence spectrometer, or (EDXRF), confirmed the presence of this strange iron material. Strangely, when magnetic influence is placed over the thickest part of the Roswell rock, the object turns counter clockwise. However, when placed above the lower crescent and circle, the thinnest part of the rock, the object reverses and turns clockwise. Many have concluded that these strange properties have something to do with magnetism, free energy, and portals waiting to be opened here on Earth. Others believe that the curious patterns, and magnetic properties are just some of the curious characteristics of the Roswell rock, and that it has still many secrets to give up. Is it a cosmic map?